According to a new survey, email marketing is not dead! Nearly three-quarters of businesses spend time and money on email marketing, according to a survey of more than 500 digital marketers. Businesses that regularly send a variety of emails to consumers retain customers and increase engagement. A Google search of “email marketing is dead” will result in more than 70,000 pages arguing about whether the age of email marketing is over. But is email marketing really dead? Not according to statistics. There are more than 4 billion email accounts across the world, and businesses are more successful at reaching consumers through email than social media: 90% of emails reach the correct consumer’s inbox, but only 2% of Facebook followers see a business’s posts in their News Feeds. Email marketing reaches consumers in ways other technology cannot. The Manifest surveyed 501 digital marketers at businesses from across the U.S. to discover how they use email marketing. Most businesses (69%) spend time and money on email marketing. Among businesses that participate in email marketing, most send marketing emails either daily (32%) or weekly (41%). 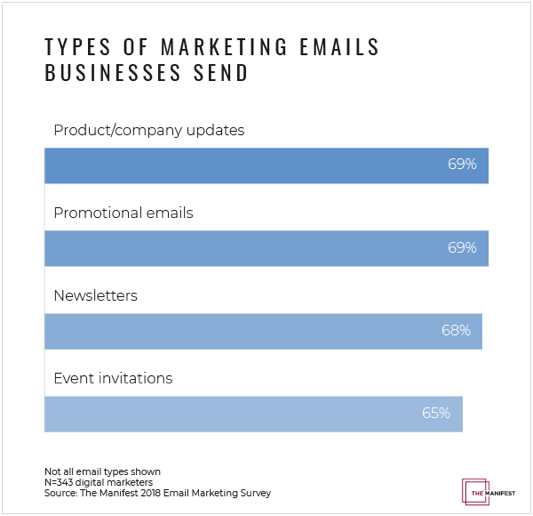 Businesses send a variety of emails, but product/company updates (69%), promotional emails (69%), newsletters, (68%), and event invitations (65%) are the most popular. When asked about their main goal for email marketing, most businesses want to grow and retain their customer base (29%) or increase engagement (22%). The majority of businesses use email marketing in their overall marketing strategy and 69% of businesses invest time and money in email marketing. Businesses use email marketing because it drives results while allowing more control than other platforms. Consumers have to sign up to be on an email list, so email marketing only reaches those who are interested in your product/service – unlike social media advertising, which may reach people who aren’t necessarily interested. This means that your open and engagement rates with clicks will be significantly greater on email than social media. Email is the way to go if your goal is to gain visibility with your audience. A 2014 study shows that email helps businesses successfully reach consumers three times more than social media. 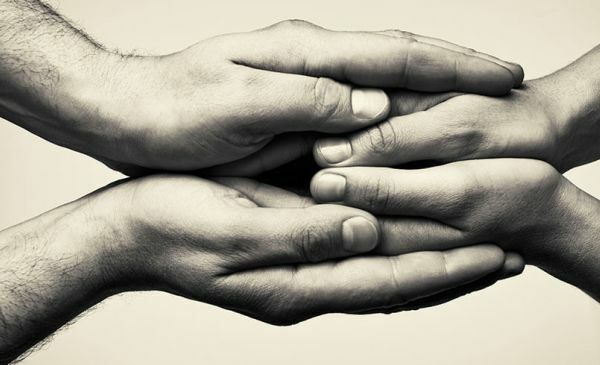 Chen Rekhi, founder of Notejoy, who also served as a senior vice president at Survey Monkey and product marketer at LinkedIn, believes email marketing is more effective than social media at building trust with customers. Customers have to opt-in to receive emails, demonstrating a higher level of interest in your company. 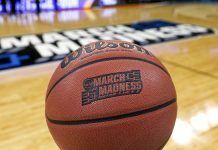 This makes it easier to convert than other channels such as social media. Businesses see the importance of sending marketing emails regularly. 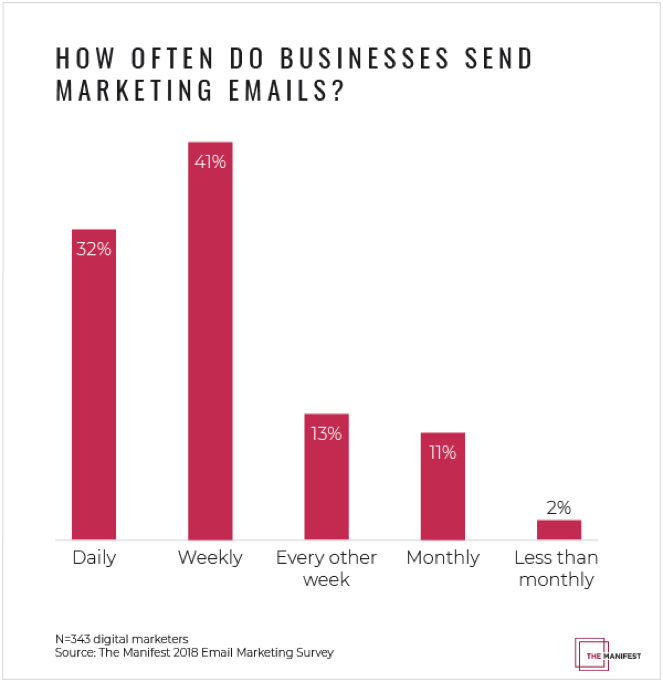 The majority of businesses send marketing emails either daily (32%) or weekly (41%). 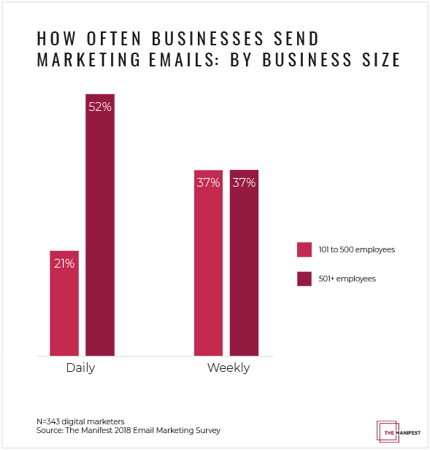 The Manifest found that 37% of businesses with more than 500 employees send marketing emails daily, versus 21% of businesses with 101 to 500 employees. Larger companies’ tendency to send more emails could be due to their larger company base, experts say, but businesses have to be careful that they don’t send emails too frequently. Only send emails when they are valuable to customers. Don’t send emails just to send emails. Some businesses have the most success sending emails every day, while others find every other week makes the most sense. Businesses should inform customers of the types of emails they will send. 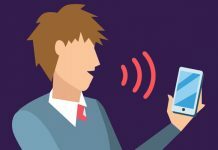 “The types of emails you send really do depend on who your audience is and what you told them before you started emailing them,” said HubSpot Demand Generation Marketing Manager Tova Miller. Sending a variety of emails can help keep subscribers engaged, as long as businesses are transparent about the types of emails they plan to send. To increase transparency, you should update your unsubscribe page to show users a complete list of the emails they have signed up to receive – an increasing necessity with the new European Union GDPR rules that regulate how companies use consumer data. The types of emails you send vary by customers’ wants and needs, and businesses can find these by developing buyer personas, or a representation of your ideal customer base. Developing buyer personas helps you get to know your customers and send relevant emails to them. The type of email you send isn’t as important as sending emails that apply to customers in their buying journey. Businesses use email marketing to accomplish a variety of goals. 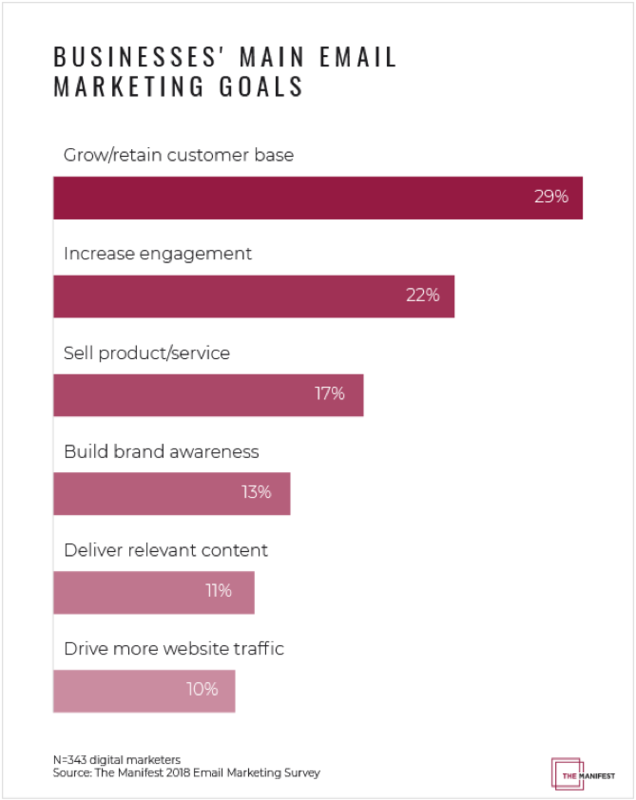 The top goals businesses have for email marketing are growing and retaining their customer base (29%) increasing engagement (22%). Email marketing is successful because it can reach customers without costing the business money. Growing a customer base and increasing engagement go hand-in-hand: Businesses should first work on growing their customer base. Once you have a large subscriber list, you should focus on increasing engagement. With a large, engaged customer base, businesses can then focus on driving calls-to-action ranging from selling products to driving website traffic. 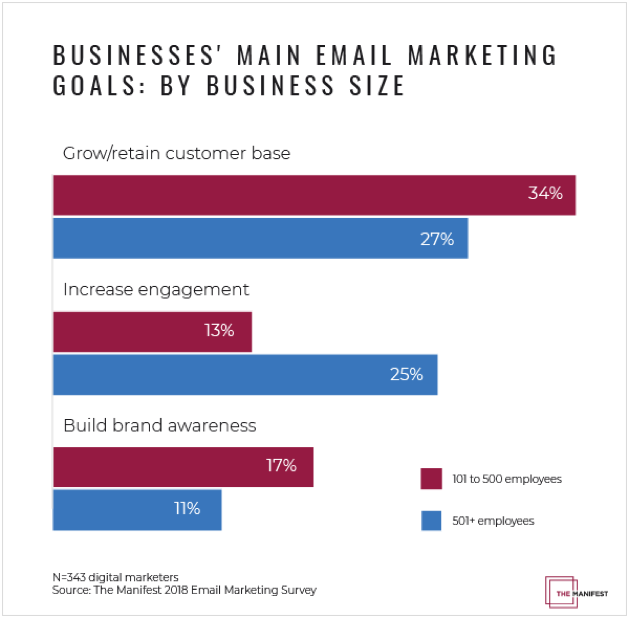 Companies with 101 to 500 employees are more likely to use email marketing to grow and retain their customer base (34%) and build brand awareness (17%) than larger companies, which are more likely to use email marketing to increase engagement (25%). Small businesses use email marketing to spread the word about their company. 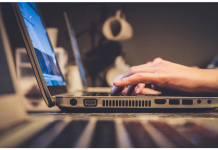 While smaller companies are trying to establish their place in the market, larger companies that have already established brand awareness are more likely to use email marketing to keep consumers interested. Smaller companies use email marketing to attract customers; larger companies use it to keep customers. Email marketing is a successful digital marketing strategy that spreads brand awareness and keeps consumers engaged. Businesses send a variety of emails regularly to grow and retain their customer base and increase engagement with their brands. Businesses should consider their brand positioning, buyer personas, and goals when determining what types of emails to send and how often to send them. Most businesses use email marketing because it works. Despite fears that email is dead, email marketing isn’t going anywhere. The Manifest surveyed 501 digital marketers from companies across the U.S. with more than 100 employees. Most survey respondents are managers (36%), associates (15%), C-level executives (13%), senior managers (12%), and directors (12%). Nearly three-fourths (73%) of respondents are from B2C companies; 27% are from B2B companies. About 29% of respondents’ companies had a 2017 revenue of less than $50 million; 32% $50 million to $500 million; 39% more than $500 million.